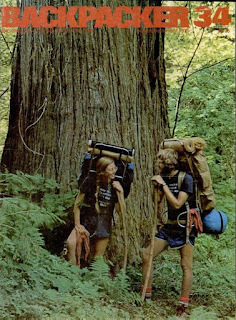 My first backpack trip for trout was about 1979 or 80 with my grandfather. 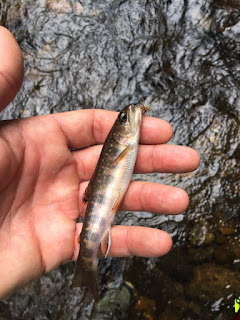 We hiked several miles into a small Western North Carolina stream to catch wild southern brook trout, the pic is from 1979 and those packs make me ache to look at. On that first trip I had an old military surplus backpack with no frame that smelled like the musty inside of an Army - Navy surplus store. The only thing I had in my pack was my sleeping bag and a change of clothes and still by the end of a short 2 or 3 mile hike, I would have sworn the shoulder straps on that pack were lined with razor blades. That old bag was warm but it probably weighed 15 pounds by itself. My grandfather carried all of the food and other necessaries in his pack, an old external frame Kelty if memory serves. Back then in the rural Appalachians people that hiked into the mountains to fish usually had a stash of the heavy materials needed cached and my grandfather was no different. In a hiding place well off the creek and where no one would think to look was a large plastic tarp, used to make the lean to we slept under, a frying pan with a gasoline burning Coleman stove and an axe. Along with that might be what was left of some oil to cook and anything else that could be left and would last till the next trip without ruining. 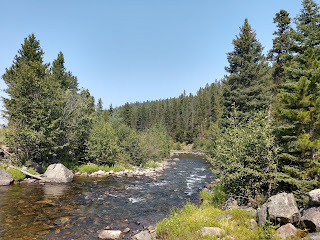 Even as uncomfortable as that old pack was and the roughness of the terrain I was hooked for life, on backpacking and brook trout. Needless to say a whole lot has changed since that first trip, both in my attitude and the quality of gear available. 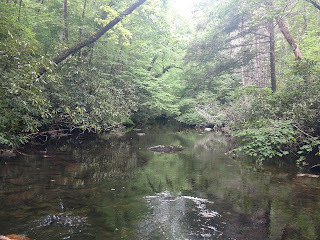 I do my best to follow leave no trace practices, the only thing I want to leave in the woods are footprints. 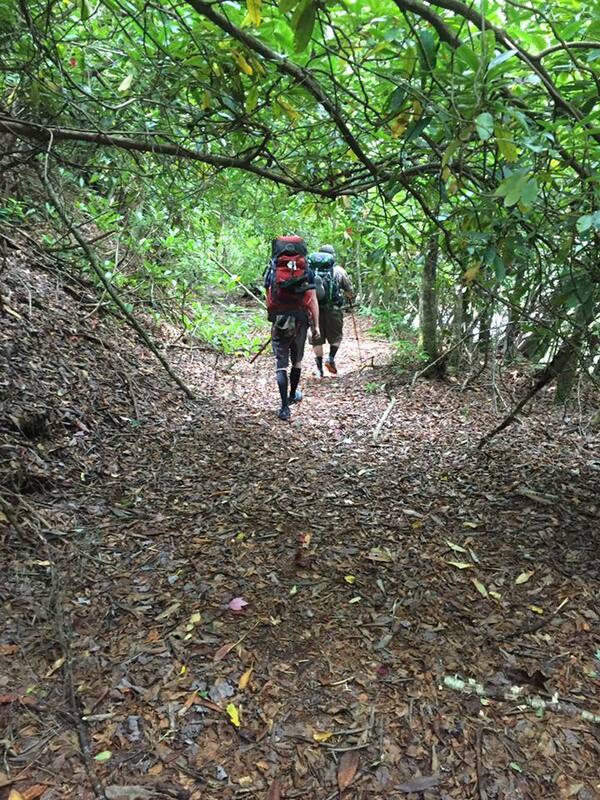 The picture on the right is of me after a particularly grueling hike off the side of a ridge through the thickest rhododendron thicket imaginable. I found the 5 gallon bucket I am setting on along with a bunch of other trash beside the stream I was there to fish. There is nothing in the world that makes me madder than people that are too lazy to carry their trash out, but I digress, back on topic. As my waistline shows, a whole lot has happened to my body in the last 40 years and some of the loads I carried back in the day are just not possible today, I am constantly looking for ways, within reason, to cut my pack weight. 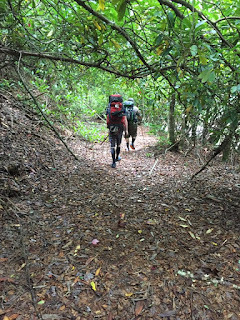 Fortunately today you can get down to a base weight, which is the weight of everything in your pack besides consumables, to 14 pounds or so without too much trouble and without taking out a second mortgage or selling a kidney. However, out of all of this new wonder gear and materials I have to say that discovering hammocks has been the biggest advancement of all of them for me. Me and my father went on a backpack fishing trip in the early 80s and my dad carried one of the early mesh hammocks to sleep in, the next morning I asked him how he slept and he said better than on the ground. 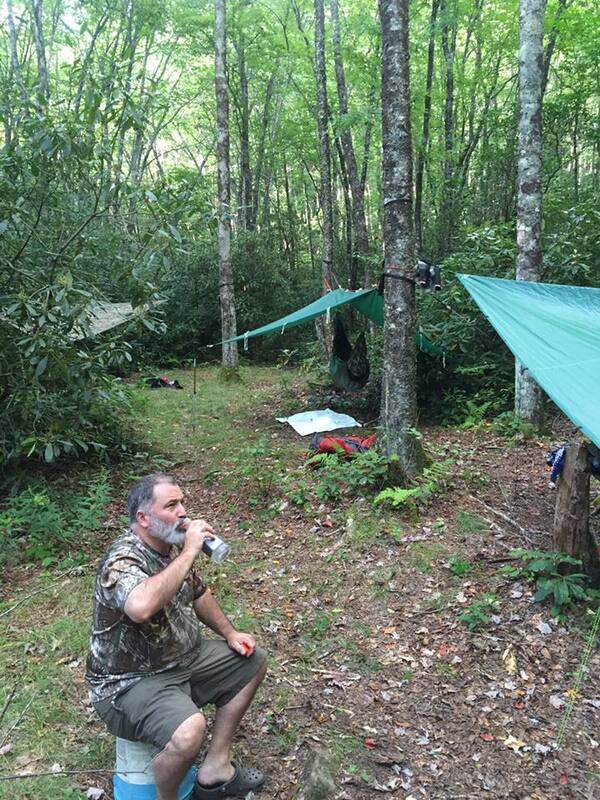 That was first time I new of anyone camping in a hammock. I failed to see the advantage then and continued to be a ground dweller up until about 3 years ago, boy I didn't know what I was missing. 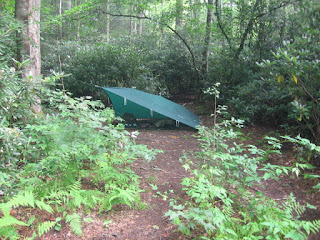 One of the things that my grandfather taught me that I never got away from was sleeping in a lean-to, I did not like to be shut up in a tent and all I needed to carry was a tarp and some cordage. Below is one of my camps from about 2008. A lean-to shelter is pretty good but has drawbacks, first and foremost is sleeping on the ground. I mentioned that all you have to carry for the lean-to is a tarp and that is true, for the overhead portion, but if you plan on sleeping very well you are going to need a quality sleeping pad so there goes your weight savings out the window. If you are one of those people that can sleep on one of those lightweight thin closed cell foam pads, more power to you, I always find every root and rock possible to jab me in the back and need a thicker inflatable pad if I hope to sleep at all. The next big downfall is the fact that water can run under your shelter and soak your bedding, leaving you sleeping in a soggy mudhole. 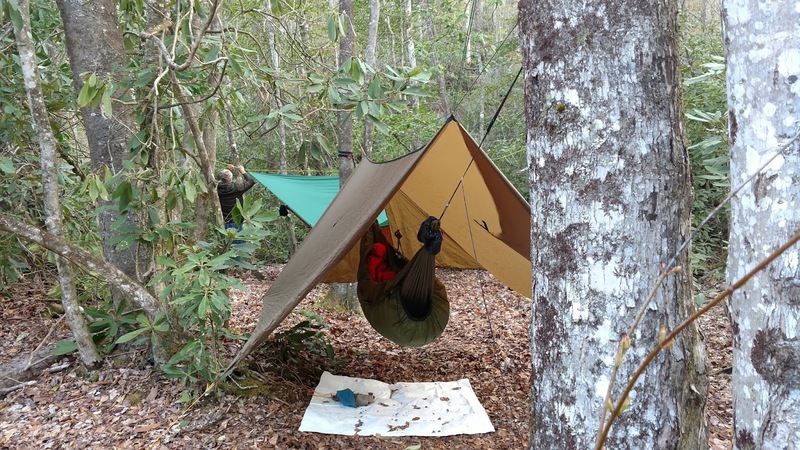 Hammocks give you the same advantages as a lean-to without the drawbacks. It is open and airy, no worries of rocks and roots and if pitched correctly as close to zero chance of getting wet as is possible on a backpack trip. Here is my current setup. Thanks for sharing your tales and experience. You definitely put in work that allows us procrastinators to skip forward by learning from you. It often feels like I'm there on the trip when I read your stories. Thank you so much, glad you are enjoying the stories. I will do my best to keep them coming.